Thursday, May 13th at 7pm. Visit www.misswestsound.org to print off your own set of invitations! You will also have a chance to view and bid on the children’s artwork during the first 2 weeks of May. They will displayed in businesses in downtown Poulsbo. You can also add “Tonie Duchemin” on facebook and then visit the event site so you can bid there. The Final Hour Auction will be your last chance to bid and to go home with a BEAUTIFUL piece of art. The artists are students from all across Kitsap Penninsula. You don’t want to miss this! Last year’s event was a HUGE success and we expect this year to be even better. 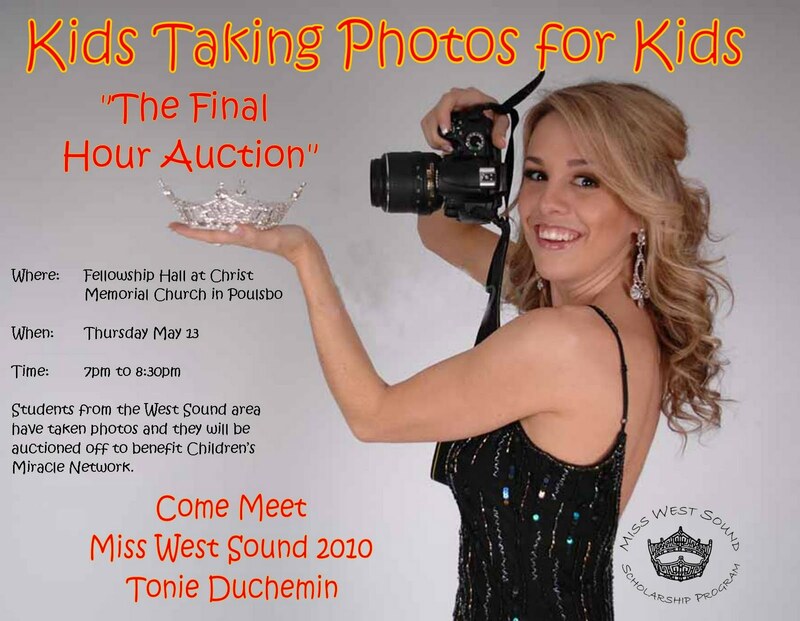 Dessert, live music, a Kitsap Blue Jackets raffle, and a chance to ask Tonie Duchemin, the first ever Miss West Sound, a question you’ve been dying to ask of Miss America….